Why do we appease the terrorist appeasers? Labour shown to be not together ? On Monday seven Labour MP’s resigned from the party to become Independent, so it was perhaps fortuitous that they were in place to deal with the crisis of their departure. 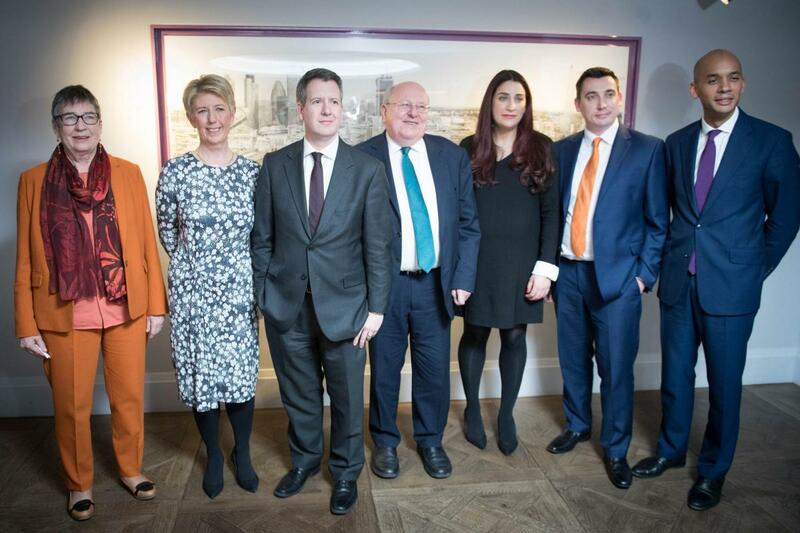 Despite all the platitudes about alleged Labour racism and extremism in the party, it seems that the issue which really binds these “magnificent seven” or “seven dwarves,” ( depending on how you perceive it ), is that they are all resolute Remainers who do not want to respect the EU referendum result. As for their belief in a second “peoples vote,” they feel that does not apply to their own constituents, who voted them in on a different policy to the one they now want to pursue! In response to calls to Home Secretary Sajid Javid to bring back the coastguard vessels to assist with migrant operations in the English Channel, newly returned HMS Cutter Vigilant lived up to its name and picked up 34 migrant just outside Dover. Having spent time being a free ferry service for migrants wanting to land in southern European countries, this vessel is now ferrying migrants into southern England. Our Navy picked up 20,000 migrants in the Mediterranean, and already hundreds have been ferried courtesy of the British taxpayer from the English Channel to our ports. When is this government going to intercept migrant smuggling efforts outside our territorial waters and return them directly to their points of departure? Or is that too much to ask of a government which is supposed to be putting UK national security and the interests of British citizens first ? Has Sajid Javid woken up to the demands of the British public ? After failing to stop the flow of migrants to the UK, it seems the Home Secretary has finally decided to revoke the British citizenship of ISIS supporter Shamima Begum. He deserves congratulations for this, but he can’t have failed to notice the massive public disquiet about her. Nor could he could have ignored the steadily building petition for ISIS supporters not to be allowed to return to the UK ( half a million and rising ). Syrian Gold being hijacked by USA ? There have been reports that ISIS Daesh commanders and tons of their looted Syrian gold have been airlifted out of Syria by USA helicopters. Whether or not this is a “deep state” operation, similar to the stories of what happened to Nazi gold at the end of the Second World War, is it not time we were told if these reports are true, and if so, why ? We are indebted to Jo Coburn and the BBC Daily Politics programme for their investigation into “Think Tanks.” While it just covered the tip of the iceberg, how many of us have wondered who funds these bodies, who they really represent and why they want to be projecting their thoughts into the public arena. Is it not time that none of these bodies are invited to political discussion programmes unless and until they act in a full open and transparent manner ? ( 432 to 202 votes ) on Tuesday 14th January this year, it was predictable what would happen. The Labour party went ahead with their threatened vote of no confidence in the current government, which they must have known would fail. It did so, with 306 supporting it, and with 325 opposing it. They then made the huge tactical blunder of adopting a conference Brexit policy, which they did think was clever and unifying at the time, but which now is coming back to bite them hard. This six Brexit tests policy has become constricting to them and preventing them from making a positive contribution to the Brexit process. The six tests have become like a spider’s web, woven by the remainers which has trapped the Labour party fly in it, unable to move. They now are increasingly coming across as a party which is trying to use Parliamentary processes to undermine the UK leaving the UK. The vote of no confidence has served no useful purpose to the Labour party or to the country. It has simply showed up a large number of MP’s of all parties, as people who trade insults of each other’s personal and political abilities. This is, quite frankly, not what the country wants to hear at this crucial time. This was exactly what the Conservative leadership wanted, a distraction from their disastrous Brexit policy. So while there was lot of debate about Brexit policy, the whole tone of the debate was a reminder of the worst aspects of our current mainly two party system. The country did not want a pointless debate about how bad the current Conservative policies have been. They already know that. They already know, too, any positive points about that government, which obviously the Conservatives put across in their defence. This debate simply enabled the Conservatives to attack the Labour party and its leadership. 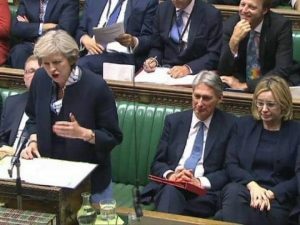 A lot of that was very unacceptable, but it did enable Theresa May to portray herself as the defender of the Conservative party, rather than the defender of her own very poor performance as Prime Minister. Labour urgently need to have a strategic re-think, as there is a danger that a continuance of their current approach to Brexit in particular, will make them as unpopular as the Conservatives. It is such a shame when the policy of bringing about Brexit was serving the party so well. Jeremy Corbyn made the added mistake at the close of the confidence debate by digging Labour in a deeper hole. He unnecessarily argued for a No deal Brexit being ruled out by the government. (In doing so, he also dented his credentials as a Eurosceptic). However, such a stance would hinder the UK’s negotiating position and hinder the prospects of a good deal. It would also increase the chances of Brexit not proceeding, which would lose Labour a lot of votes at the next election. It comes across as a wrecking tactic, rather than a constructive one to help facilitate Brexit. Another major point about all this is that the country is well aware that there is a shortage of Parliamentary time for a number of very important issues. Labour have effectively wasted a day of that precious time, which no one will thank them for. There needs to be more focus on Labour wanting to make a serious contribution to enabling Brexit to be delivered. Labour did the UK an excellent service by helping defeat Theresa May’s so called Brexit “deal.” Now Labour must itself review its six Brexit tests. Labour is making the classic mistake that parties have made over many years and that is assuming that what party members want, is what the people want. Labour would be foolish in the extreme if party policy became anti-Brexit when their MP’s have not been voted in on a no deal Brexit policy. As the Prime Minister is now being asked to be flexible, Labour has to be as well, if they want to honour the referendum vote to leave the EU. The ironic point about this no confidence vote is it could have been successful, if the Labour party had come to an accommodation with the DUP. Their ten votes would have ensured a Labour success. I am well are that virtually nothing is impossible in politics. As the Labour leadership know they did not have the DUP onside, they simply should not have bothered with insisting on this confidence debate. Now is the time for Labour to stop pandering to remainers and return to being the champions of the British public. 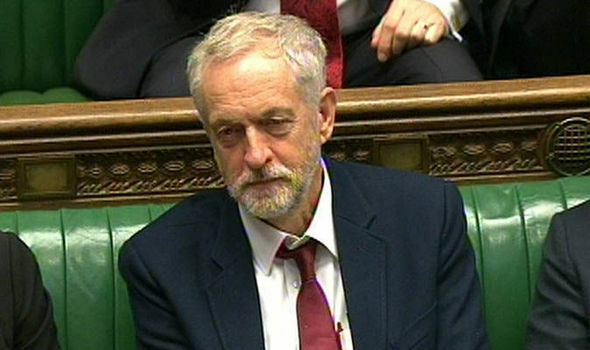 Jeremy Corbyn has so far refused to take up the Prime Minister’s offer for talks on Brexit. He is insisting that the No deal option is off the table first, something not in the Labour party’s last general election manifesto. It is to be hoped that he will change his mind, otherwise this will not be just damaging for Labour, but for the country too. It is to be hoped it will be the start of Labour Brexit co-operation and delivering what the British people voted for. A group of Conservative politicians have offered proposals for a constructive way forward for the UK, which should be accepted. If they are not and the Labour party continues a policy of intransigence, then there is a risk of the public turning to UKIP or a new party. If the public are betrayed on Brexit, they will desert both Labour and Conservatives. 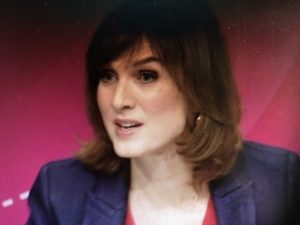 Disappointingly, the new face Fiona Bruce Question Time has not ditched it’s old “Remain” bias. 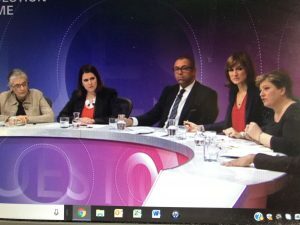 The BBC (British Brainwashing Corporation) yet again picked a panel of mainly “Remainers” for last Thursday night’s programme. Of the five facing the audience, only one was a Leave supporter, three were Remain supporters, and one, James Clevelly, MP, a supporter of the government’s “deal,” can hardly be put in the Brexiteer category. Considering the majority of the country voted to Leave the EU, it is actually a disgrace that the BBC continues to treat those who won the Referendum as a minority whose views are not worthy of considering. The BBC not only prevent a minimum of equal representation for the Leave cause on their panels, but they somehow end up doing the same with the audiences, where it is a struggle to locate any Leave supporters at all. Clearly the BBC’s New Year’s resolution ( alongside most of the rest of the media ), was to remain with the old bias, something the majority of us must ensure they correct this year. What we need is the word “brainwashing” to be replaced with the word “balanced,” so we can have a BBC we are proud of. Another area the BBC need to address is this habit they have of inviting pretty useless people to serve on their panels. 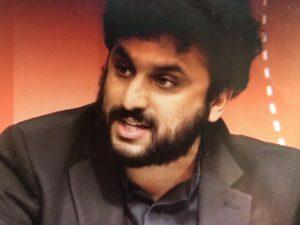 Nish Kumar, a comedian, came close to the truth when he admitted the government’s Brexit deal was less popular than his jokes. He ended up having an unseemly spat with columnist Melanie Phillips, but why was this his third appearance on Question Time in twelve months ?! Once is too much. However, he seems to be one of those politically correct individuals who can be relied upon to put across acceptable globalist views, and therefore he will probably be invited yet again. In contrast there are many people who could be asked to appear on Question Time and similar programmes, but either never are, or if they are, find they are outnumbered by the opposition. If they never are invited, they could be like me, appeared on RT News three times last year, but never on the BBC. The BBC, like most of our media, cannot bare having intelligent people on their programmes who can challenge the globalist way of thinking. No, they prefer people to ensure such views are either not put forward or put forward by people who can give the impression that such views are intolerant , not informed, not educated, lower class, and that they simply are extremists who don’t know what they are talking about. What is essential is for the BBC and the media generally to reform, but that is not going to happen without the citizens of our country insisting on change. This is a reason of the springing up of “Yellow Vests” movements in different parts of the country. Inspired by the revolutionary fervour of the French people who have become fed up with being taken for fools by their political class, it has been seen that the people can make a government listen to them. In the UK the “Yellow Vests” will continue to attract support until the UK ruling elite changes how it runs the country, especially the negotiations with the EU. On Question Time, the one Brexiteer on the panel, Melanie Phillips, spoke a lot of truth when she said that the government had given control to the EU from the very start of the EU negotiations. What she did not say was that the general public is fed up to the back teeth with this constant letting of the nation down. Melanie’s comment that with Britain free of the EU, it would take them to the cleaners, is the sort of proud statement many British citizens would like to exemplified in optimistic post Brexit plans. This first Question Time of the year was a timely reminder of the various individual MP’s and other forces at work, who will attempt any means possible to thwart the UK leaving the EU. Thus it is important to “frustrate their knavish tricks,” and bring about the Brexit we all voted for, and it was certainly not one which was dependent on having a deal with the EU at the point of leaving. Have Theresa May’s problems stemmed from her failure to keep faith with the DUP?